The plan? Just give vegetables catchy new names, and see what happens. Don't like regular carrots? How about X-ray vision carrots? Broccoli is gross? Well, can I interest you in some tiny tasty treetops? "One kid we met, his parents had told him to pretend he was a dinosaur eating trees," said Just, "and it actually got him to eat broccoli." After a few small but successful experiments, Just and his co-author, noted food researcher Brian Wansink, applied the theory at local elementary schools. "By changing the carrots to X-ray vision carrots, a whopping 66% were eaten," according to the text of the report, "far greater than the 32% eaten when labeled 'food of the day,' and 35% eaten when unnamed." The next study took on broccoli and green beans. "The results were outstanding: Vegetable purchases went up by 99% in the (study) school, while in the (control) school, vegetable sales declined by 16%," according to the report. Sometimes the simple solutions are the best solutions, Just says. "These things are just basic tools in marketing. These things are well-known by people who try to market less healthy foods to our kids," he said. "Why not use these things to get our kids to eat health foods? We've got to use every tool and trick at our disposal." And the best part, he says: This simple name change costs absolutely nothing. "We've reached out to about 13,000 schools thus far, but we're trying to roll this out as far as we can," he said. "We're asking anybody who will listen to us to give it a shot." 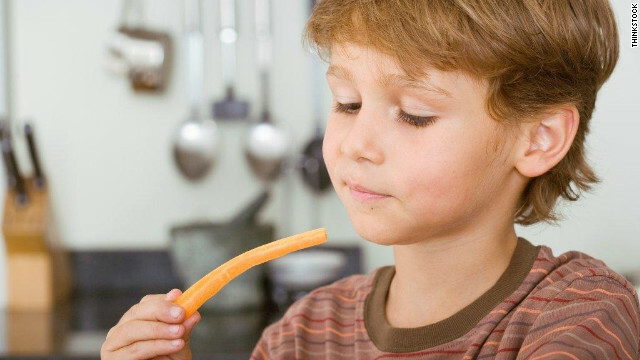 It's weird to think that more and more kids don't want to eat their vegetables but over time if they were integrated into the meals for example some pastas have shards of vegetables in the sauce to help children get the recommended amount that they need without detering them from hating their favorite foods. Sometimes we as parents get too caught up in the tasks, and forget to relax and have a little fun! I never knew children don't like fruits and vegetables until I came to the US. Maybe if people stopped assuming kids don't like vegetables and fed their kids balanced meals early on, then this problem would not exist. My mother always cooked with lots of vegetables and the options were to eat what was in the plate or to not eat. The only vegetable I did not like as a kid was cauliflower; I ate it anyway because it was a better option than go to bed without food (I tried both options). Now an adult I actually like cauliflower and will eat and enjoy pretty much all foods. I have always told my son the health benefits of food. He likes the idea of eating food that will make him big and strong. He eats raw green beans like some kids eat potato chips. He only drinks milk and water. He likes broccili. The whole issue is keeping good food available and treats at a minimum...kids eat good food when its available. Truly the idea of good marketing applies to all sorts of things. I think examiners, who said that kids in many countries eat less vegetable and fruits, found that majority of kids liked steamed or boiled vegetables the best. My daughter who is 16 year of age love Healthy Bars of Sheffa Foods, well its a good health snack for her. In fact the carrots and beans retained their original taste, color and crunchiness, which also make good snacks for kids. Also, the kids become familiar with the vegetables surface and their color too. It's truly a nice and useful piece of info. I am glad that you simply shared this useful info with us. Please stay us up to date like this. Thank you for sharing.